Professor Julius Venkmann could at best be described as a Genius and at worst an Evil Genius. The Professor's life of research and study came to an abrupt end when Volean raiders attacked his secluded research facillity. His home destroyed, wife murdered and his young daughter taken, the Professor vowed to escape the slavery he was sold into and to avenge himself upon the Voleans. Taking cruel advantage of his first owners, within a year the Professorhad freed himself and set about enacting his revenge. Trading his knowledge and insights to the highest bidder Venkmann amased a small fortune including a devils resume of favors. While awesome in some respects, the Professor is the mind behind a dozen of the most lethal battle systems ever created, six of which are banned by every coinceivable arms treaty in existance. The end result of his most radical ideas are encompased in his own personal starcraft. 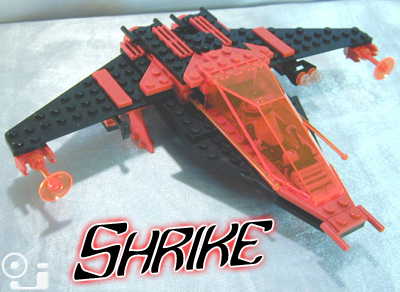 The Shrike would seem to be a smallish mediocre attack craft, but under the skin lay ststems uneard of in other small craft. The IR drive alone acts as a cloaking device, shield generator, drive system, and weapon capable of damaging planets. These outrageous systems were all put to the test in the annihilation of the Volean homeworld. At loose ends, the Professor was for a time a high bounty target. This led to his first meeting with Archibald Winter, an uneasy alliance and eventual position in Oddjobbers R&D, an agreement not to use his skills for genocide and a continuing Odjobbers effort to locate his daughter. Premier Theoretical Physicist, Advanced weapons systems consultant, Hand to hand combat instructor. Botanist. "This man should be executed. " "Devilish cunning unbound is always better on your side"
"His past may be... disturbing, but his genius can save more people than it has destroyed. Truly he has saved us." "He's still a wanted man, still has a bounty on his head you could buy planets with, and the only people dumb enough to try collecting are already dead."